The risk of war with North Korea remains real. And Trump and Abe are pushing us further in that calamitous direction. If there’s one thing to say about President Trump’s trip to Asia, it’s that the excursion was relatively subdued. With the exception of one tweet and a not-unexpected display of chumminess with Filipino president Rodrigo Duterte, Trump didn’t commit any major gaffes or blunder into any events of elevated consequence. And in many ways, that was the entire point. As commentators have repeatedly reminded us, Trump was visiting Asia to reassure the region he isn’t a total loose cannon. With North Korea engaging in increasingly provocative actions, the narrative goes, it is important that Trump ease international fears about his temperament and work to align rather than divide the regional actors currently embroiled in nuclear drama — particularly US allies like Japan and South Korea. But festering under the placid surface of Trump’s visit are serious fractures. Despite a veneer of unity, the Japanese and South Korean governments have divergent interests and major disagreements about how to deal with the North Korean dilemma. Both have a sizable influence on US policy toward the DPRK. And while South Korea’s position is at least worthy of critical support, Japan is taking an approach that is at best unhelpful — and may even be increasing the risk of war. Presented in US media as a reliable partner, free trade advocate, and staid political conservative, Abe’s popular image ignores the nationalism, even imperial apologism, that has defined his career and marks the party he now heads. Abe’s primary policy aim — amending Japan’s pacifist constitution to clear the way for greater military activities — is something of a legacy project. His grandfather, former prime minister Nobusuke Kishi, tried and failed to change the constitution during his tenure from 1957 to1960. Abe, the story goes, was inspired to take up the cause and has vowed to fulfill his grandfather’s dream of a robust, proud Japan. That all sounds relatively benign until you learn that Kishi also served in Hideki Tojo’s imperial cabinet as minister of commerce and industry — and helped oversee the brutal Japanese conquest of Manchuria. After World War II, seeing Kishi and the Japanese right as reliable bulwarks against communism, the US quickly made peace with its former enemies. While the US had imprisoned Kishi as a “Class A” war criminal for three years, they released him without charge. More importantly, the US used illicit CIA funding to help the newly formed Liberal Democratic Party (LDP) become a dominant force in postwar Japanese politics. Kishi, a founding member, became prime minister with the full backing of the United States. In addition to his family ties, Abe’s nationalist exploits include paying a now infamous 2013 visit to the Yasukuni shrine, which memorializes imperial war criminals. The event was such a blatant insult to the Korean and Chinese victims of Japanese aggression that even the US had to express public disapproval of his actions. (While he hasn’t visited since, Abe continues to send regular offerings to the shrine, doing so as recently as last month.) And until her resignation this summer, Abe’s heir apparent in the LDP was former defense minister Tomomi Inada, a historical revisionist who does not regard World War II as a war of aggression and does not believe Korean “comfort women” were coerced into their roles. This is the company Abe keeps — and the sort of political leader he thinks should determine the future of Japan. Obviously, Abe would not go immediately rampaging through East Asia even if he won his coveted constitutional change. But the LDP’s victory in recent snap elections has brought its long-standing goal closer, and the DPRK’s nuclear ambitions — particularly the missile tests that have at times flown over Japan — have served as a compelling justification for what was once considered an impossible political lift. 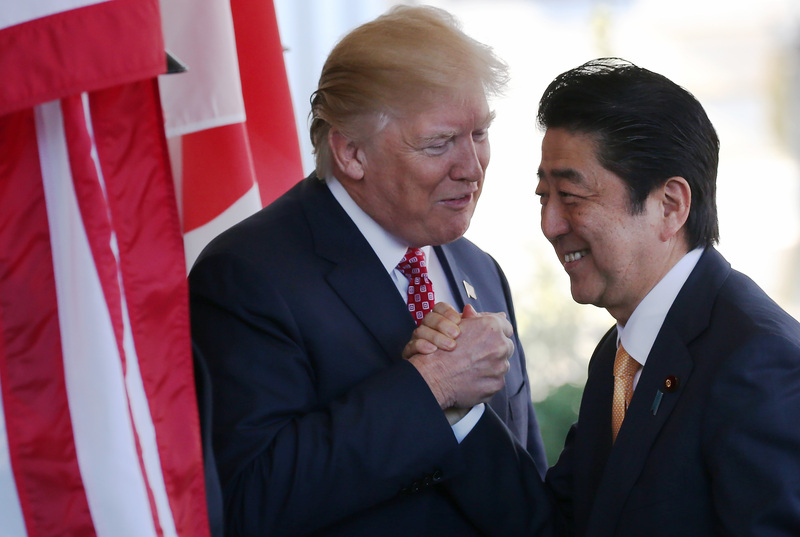 Backed by Trump and the mainstays of respectable punditry, Abe can now point to the regional security environment as a purportedly common sense reason for remilitarizing Japan. The US couldn’t be happier with the situation, of course, since it sees a rearmed Japan as a key element in containing North Korea (and increasingly, China) that would conveniently usher in billions in arms deals. In other words, Japan and the US are not incentivized to talk with the DPRK, since reduced tensions would undermine the rationale for constitutional change. In fact, Abe and Trump’s public pressuring of North Korea might be seen as a way of keeping these tensions heightened — promoting the cause of militarization without actually endorsing military action. Needless to say, this is an incredibly dangerous dance. Shirking diplomacy to cynically enable a military buildup in East Asia (for peace, of course! ), the two nationalists may be edging the world closer to war. If Japan is seen as the US’s most reliable partner in the region, South Korea is increasingly viewed as something of a wild card. After massive protests brought down the conservative president Park Geun-hye in early 2017, the US rushed to take action before the incoming progressive government took power. The new president, Moon Jae-in, had been critical of the country’s US-supplied anti-missile system (known as THAAD), and although his criticism focused more on procedure than substance, Washington feared he might delay the deployment or even cancel it as part of his stated aim of increasing engagement with the North. Moon emphasized his willingness to “say no to the Americans” during the campaign, and generally embraced a position that, while hardly radical, suggested a degree of autonomy for South Korea that was a departure from the kowtowing of recent conservative governments. A slew of North Korean missile tests — and the country’s first test of a hydrogen bomb, which it seeks to put on a long-range missile — has put a damper on the initial optimism that greeted Moon’s election in May 2017. Against the wishes of China and Korean activists, THAAD launchers have now been deployed in Seongju, South Korea, and Moon has adopted a far sterner line on the DPRK — with military improvements to match. Still, Moon has acted as something of a firewall against the worst actors in the ongoing nuclear drama. He has insisted that military action against the North cannot be taken without South Korean approval, and has pushed back against the opposition’s demand that the US redeploy nuclear weapons to the peninsula. (Some conservatives, in a right-wing twist on Moon’s desire for relative autonomy, are even floating the idea of an independent South Korean arsenal, a serious proliferation threat that Moon also opposes.) And despite using tougher rhetoric since taking office, Moon has yet to reject his pro-engagement stance — a position that places him in direct opposition to Abe. With China and South Korea’s recent rapprochement on the THAAD dispute (which has plagued Chinese-South Korean relations for an entire year), there’s an opening for a broader pushback against the hawkish line. Chinese leader Xi Jinping, like Moon, has been a prominent voice for diplomacy, and greater alignment between China and South Korea could counterbalance the Abe-Trump emphasis on pressure and, potentially, military action. Moon is an idiosyncratic figure. While right-wingers like to caricature him, he cannot be slotted easily into the familiar category of naive peacenik. Moon recognizes, like many Koreans on the peninsula and Korean Americans in the United States, that war is not a legitimate option. A twenty-first century continuation of the still-unfinished Korean War would bring about victory only through untold devastation in the North and the South. It would be unification through annihilation. That Abe and Trump are willing to gamble with the lives of hundreds of thousands, if not more, is an affront to the families still divided by the DMZ and all who have spent decades working for peace. In theory, events could still push Moon to adopt a position similar to that of Abe and Trump. But for now, his resilience in the face of Trump’s bellicosity and Abe’s quest to rearm is to be commended. He is hardly a perfect figure, still less a leftist, but with the stakes so high it is serendipitous that the current leader of South Korea remains an advocate for diplomacy. Trump’s supposed overtures aside, the risk of war remains very real — and the forces of peace must take allies where they find them. John Carl Baker is a Mellon-ACLS Public Fellow. His writing has appeared in Bulletin of the Atomic Scientists , the New Republic , War Is Boring , and elsewhere.